Carrying around extra weight can put men at a higher risk of cardiovascular disease, type 2 diabetes and certain cancers. Luckily, you can lose weight and tighten up your body with the right exercise routine. While moderately intense aerobic exercise is the traditional recipe for weight loss, a shift toward high-intensity exercise is fast becoming the more effective way to lose weight. 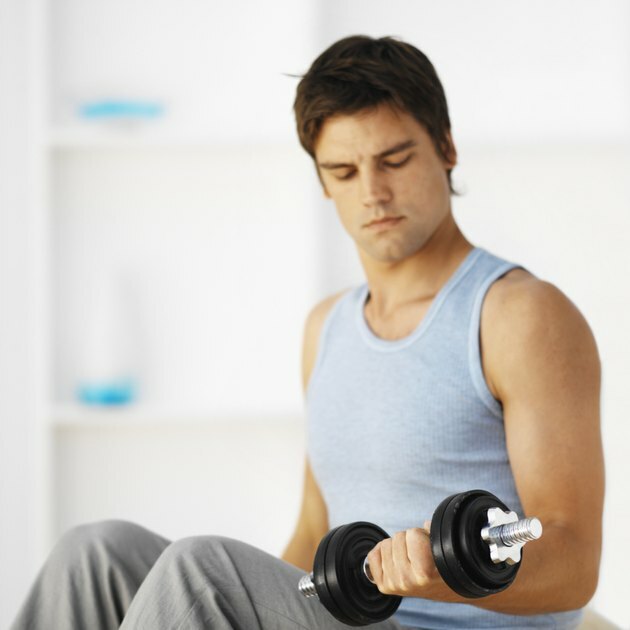 Because men have a higher proportion of muscle tissue compared to women, an effective weight loss strategy for men is to focus on building muscle through weight training and high-intensity training. Muscle tissue burns a lot of calories, so building more muscle through weight training can help you burn more calories, and thus lose more weight. Muscle tissue burns about 25 percent of your total calories used while you sleep -- it keeps your metabolism high 24 hours per day. Additionally, resistance training helps boost hormonal production of adrenaline, human growth hormone and testosterone – all of which are key to building muscle and burning fat. The key to maximize the weight loss benefit of weight training is exercising at a high intensity, meaning using heavy resistance. Choose a resistance level you can do no more than 12 repetitions with. If 12 reps is challenging, the weight level is right. High-intensity interval training, or HIIT, burns fat much in the same way weight training does, so it’s an effective addition to this three-day-per-week workout plan. HIIT, like resistance training, elicits a beneficial side effect referred to as excess post-exercise oxygen consumption, or EPOC, where your body continues to burn calories at an increased rate after the workout is done. The effect is more significant in men than women. Men can experience EPOC for a full 48 hours after a workout is completed. HIIT workouts follow a simple strategy: vigorous exercise followed by moderate exercise, and repeat 10 or more times. You can use any aerobic exercise, such as sprinting, cycling or elliptical training. Do each “work” interval at nearly all-out effort and each “moderate” interval at about half your maximum effort. Start out by doing 15-second “work” intervals followed by 60-second “moderate” periods. As your fitness level improves over the next four to six weeks, increase the “work” interval by five seconds per interval to keep the workout challenging. Set aside 45 to 60 minutes for each workout, which includes time for getting ready, warming up, cooling down and stretching. Work out on Monday, Wednesday and Friday – or whatever days fit your schedule best, as long as there’s one day of rest between each session. The first workout of the week will be your upper-body weight training day. This may consist of bench press, bicep curls, triceps dips, shoulder press, bent-over rows and lat pulldowns. Your second workout of the week is your HIIT day. The last session will focus on your lower body muscles. A sample lower-body workout may include squats, calf raises, leg curls, leg extensions and deadlifts. Start with these exercises, but integrate other resistance training exercises to add variety to your workouts. Target 10 to 12 reps per set. A total of four sets per exercise is ideal to start. Increase the number of sets and resistance level as it becomes easier in the coming weeks and months. Rest for about 60 seconds between sets. For your HIIT workout, aim for 16 rest-and-moderate intervals to start – that’s a 20-minute workout. The key to making this weight loss regimen work is to challenge yourself each time you exercise. If the workout seems too easy, it’s important that you increase the intensity to make it challenging. BuiltLean: Cardio vs Weight Training for Weight Loss – Is Duke Study Misleading?